Up for consideration is a clothing pattern to fit the 17" Hermione Granger, Susan Pevensie & Nancy Drew dolls. 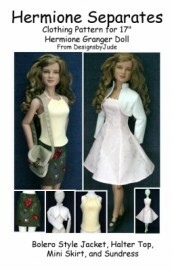 The pattern includes a halter top, mini skirt, bloero style jacket, sundress & belt. Included are seperate pattern pieces, instructions and photos of possible outfits. Pattern has been designed to use with tee shirt cotton knits, cotton blends, light weight denium or similar fabric. This design is also available for Tyler, Ellowyne and other size dolls. The pdf version prints on 8 1/2 x 14 legal size paper.